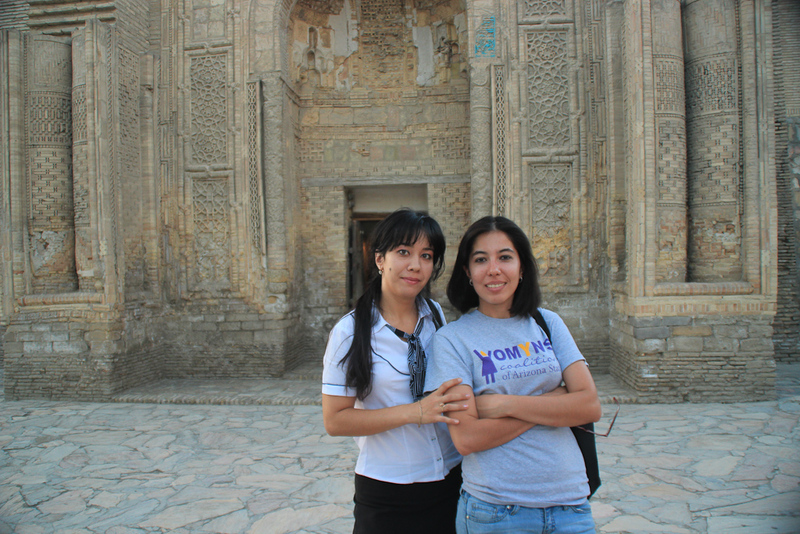 I am running a bit late, the blog is 2 countries behind me so I will try to summarize Uzbekistan in this post. Pictures will come later. Tomorrow is another long riding day but there will be shorter days later in China. 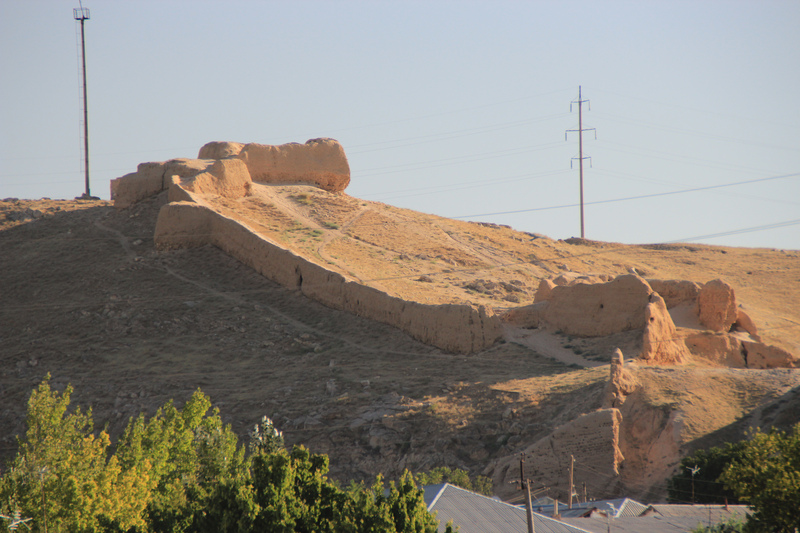 I tried to leave Bukhara the next day as planned and after turning around for a long time, I did. I had planned to go to Aidar Kul and camp for a night there so I needed a big 5L bottle of water, then I turned some more looking for the road to Navoiy, my first waypoint and when I finally found it, I left. And came back after 30km because I still hadn’t found decent fuel for the bike. The only gas station that had some, didn’t have electricity to run the pumps. Around 12:30, I was finally on the road to Nurata in a strange mood. After an hour and a half I overtook an odd looking vehicle, it had “Ambulancia” written on the back and a Spanish licence plate. I honked and the driver turned on the siren. Later, while I was resting in the shade and rehydrating myself, they passed by and turned the siren on again so when I rode off and found them putting some Diesel into their engine, I pulled over and talked to them. Two Basques driving an ambulance to Mongolia, taking part of Charity Rallies, a bit like Mongol Rally but more serious (according to them anyway). They said it was lunch time and that they were going to stop and eat at the next shade they could find. I rarely have lunch when I ride but I accepted their invitation. It was a proper Spanish lunch: it took 2 hours but I enjoyed their company, I don’t have many opportunities of speaking Spanish in this trip. By the time we set off again it was 4pm and when I got to Nurata, I felt it was too late to ride to Aidar Kul so I retraced my way back to the main road and decided to go directly to Samarkand. Bad decision. The main road to Samarkand has many little towns, which makes it very unsuitable for wild camping when it becomes dark so I rode more than 1 hour in the dark to get to Samarkand. When I finally found the hostel I wanted to stay at, the entrance was full of bikes (Neil and Iain were there plus another biker on an XT660R, at first I thought it was Chris but he’d left that morning) and the hostel was full so I was sent to the annex, a bit more expensive but with wi-fi. The SPOT stopped working when I arrived to the Bahodir hostel. It was a lazy day, I rested most of the day, had lunch with some Mongol Rally guys and a cyclist, Mark Wright who is going to Hong Kong on his bicycle. Before the end of the day, we did Neil’s oil change. He did most of it because I was late but I helped by producing a makeshift funnel to pour the oil into the bike and getting my hands dirty when the funnel didn’t work quite right. There’s no bike oil in Uzbekistan so we put car oil in it and scheduled my bike’s oil change for the next day at the same hour in the same place. 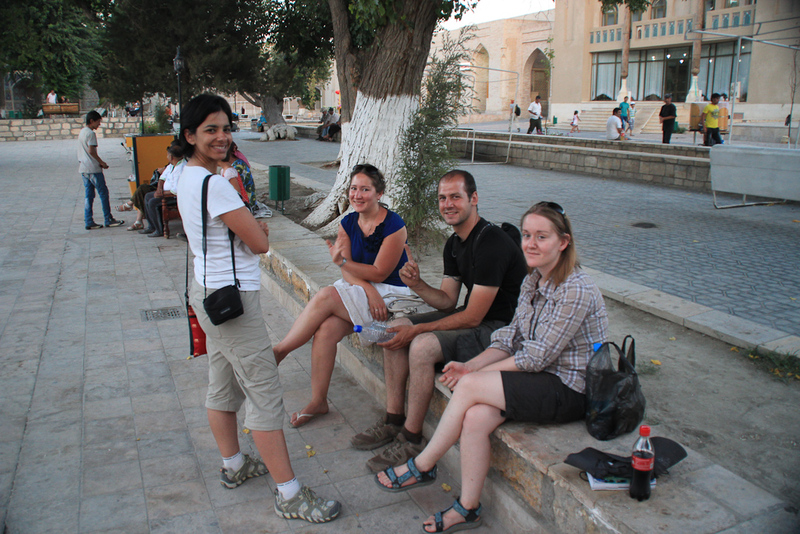 Once finished, we had dinner with Tina (remember her from Bukhara? ), the Mongol Rally guys (Andy and Toby) and Mark again. Truly, it was a very lazy day. Today, I did go out to play tourist. At Bukhara, Cédric and others that had already been to Samarkand had told me that all monuments in Samarkand had a secondary entrance where you don’t pay if you are brave enough to take it. Apparently it’s a well-known bit of tourist lore that gets passed on from tourist to tourist at guesthouses around Uzbekistan. I tried to apply it in the Registan but the secondary entrance was being watched so I just went around it, snapped a bunch of pictures and went on my way to the Bibi Khanim mosque where I did use the side entrance, totally worth it :P. After that I went on a 5km walk around a not so interesting part of town just trying to find Shah-i-zinda. It’s not that difficult, I was just lost and too stubborn to turn back. Once I got there, I was so tired that I didn’t feel like trying to find the secondary entrance so I paid my ticked and visited the famed necropolis on my own. Finally, I went back to the Bahodir B&B to do my oil change and enjoy another home made dinner with Tina, Neil and the Mongol Rally guys. Marion (from Bukhara) was there too but she didn’t have dinner with us this time. Samarkand is very different to Bukhara and Khiva. Although the monuments are all similar: grandiose mosques and madrasas covered in blue tiles, not always respectful of the Islamic ban on imagery of live creatures; the disposition and level of restoration are quite different. 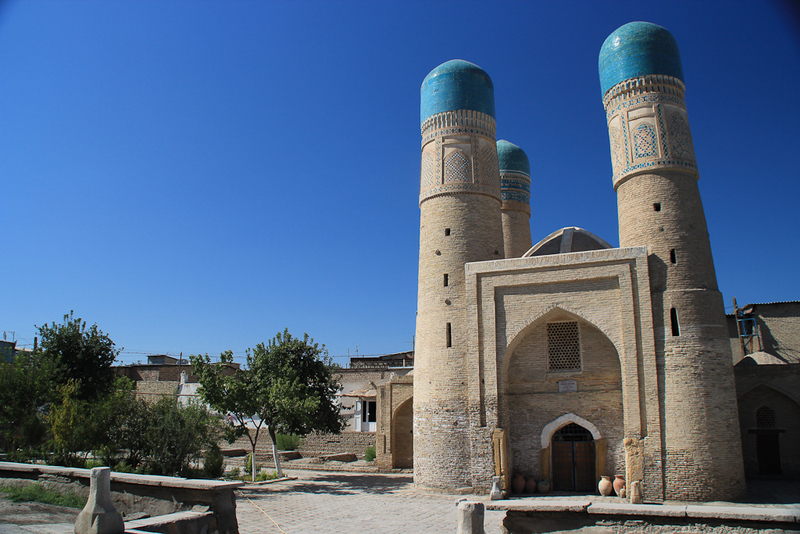 In Khiva, all is concentrated in the Ichan-qala citadel, in Bukhara the monuments are a bit further apart but you can still see a sort of coherence and it’s very easy to cross into the new part of town. Finally, in Samarkand old and new mix everywhere, the sights are far apart from each other and the entrance tickets are expensive for foreigners (locals pay 10% of what we pay). I liked the three of them but Bukhara I liked most. 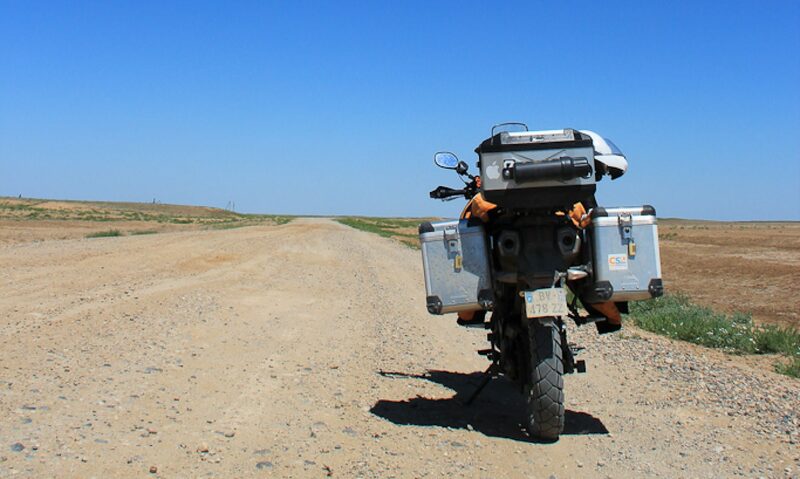 On the 12th we (Neil and I) set off not so early on our way to Tashkent. I hadn’t planned to visit Tashkent, the long road to Kyrgyzstan had started and that’s what I did. On the way to Tashkent a couple of unusual things happened. We were overtaken at the speed of light by an Uzbek biker. Yes, a local biker, member of the illustrious Tashkent Steel Scorpions. Two minutes later he was on the side of the road, he had run out of fuel. I pulled over and siphoned 3 liters from my tank (I’m becoming quite good at this) to give him and he gave me some money in exchange. I was going to give them for free but he insisted. Then he started gesticulating about not being able to start his bike so we pushed him around a bit. After a while I got tired of sweating behind a bike that wouldn’t start and grabbed my hammock’s rope from my top case, tied it to the back of my bike, looped the other end around the center of his steering and gave him the loose end to hold against his left grip. I towed him for 30 or 40 meters and his bike started but he didn’t understand that he had to release the rope once it started working so I had to stop. With his bike running, he left at the speed of light again only to turn around 1km down the road into a gas station. Later on the road we saw 2 Italian GSs with their panniers in a sorry shape and the riders nowhere to be seen, police all around and a couple of locals filling declarations. Apparently one of the Italian guys had broken his leg. Poor guy, such a bad ending for his trip. When I got to Tashkent, I took the last bed at the Gulnara guesthouse and discovered that Tarik and Ryo were here too (I had met Ryo in Bukhara and again in Samarkand). While I was lazing at one of the tea beds and eating the last of the pistachios Tzveti had given me when I left Metz, I heard someone ask someone else if he was Nacho. It was Chris talking to a random bearded guy at the guesthouse. I quickly made my presence known and we chatted about the plans for the coming days and his trip so far. After a Russian cheeseburger dinner I went to bed early, we were riding to Fergana the next day, making our way to Kyrgyzstan via Osh. So at 10:30 we met Neil at his hotel and started towards Fergana. Not without first topping up with 80 octane fuel for the first time. The road went on uneventfully except for Chris’ frequent stops to top up his radiator with water (his water pump was leaking) until we reached a mountain section that is very close to the Tajik border. As usual with this kind of places in the region, there was a police checkpoint and all the foreigners had to be registered. But we were not the only foreigners arriving there at the same time, a huge group of Italian bikers (11 bikes?) was there too and we chatted a bit with them while we waited to get registered. The two bikes that we had seen the day before belonged to this group. It has been more than one month since I arrived to Istanbul and it was time the bike got washed so we were splashed by some rain while crossing the valley. One month, two rains, quite a score. 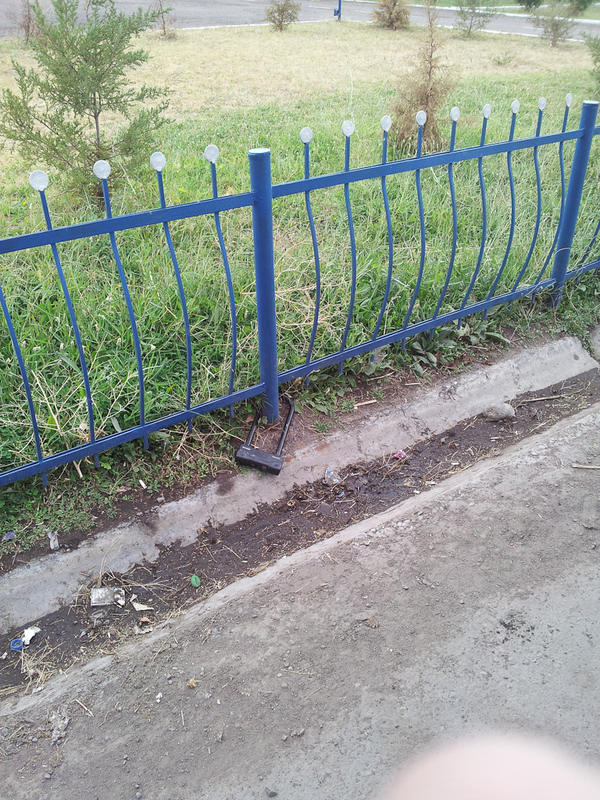 At the other end of the checkpoint, I finally ditched my U-lock, it was too heavy and I hadn’t used it since Romania. Just in case I ever come back to this valley, I attached it to a fence and kept the key (quite a silly thing to do but I’m sentimental that way). Also, at some random spot where we had stopped to top up Chris’ radiator, a bottle of water was thrown at my ankle by a passing truck. There was two Uzbeks with a broken down car there and they had been signaling truckers for water, it seems to be a common thing for truckers to throw water at people in need, very nice of them. Quite late, almost at sunset, we arrived to Fergana and started looking for the guesthouses described in Lonely Planet with little luck, none were there to be found except the last one we tried, Valentina guesthouse, actually an apartment for rent for the night. Not too cheap, not too expensive, not too clean, not too dirty but quite big and comfortable. I am not a tourist, I am a traveler -I said. And my Russian teacher responded: Я не турист, я путешественник. I keep telling people I am not a tourist. I am not motivated by the monuments, movement is my drive. Change is life. But when I am in cities, I play tourist a bit. It can be interesting sometimes. I finished the previous post saying that the next one would find me at Madina & Ilyos guesthouse and there I was. Madina, the Uzbek matron running the house with her husband had put a brick on the floor to reduce the height of the entrance step so that I could get the bike inside the small courtyard. 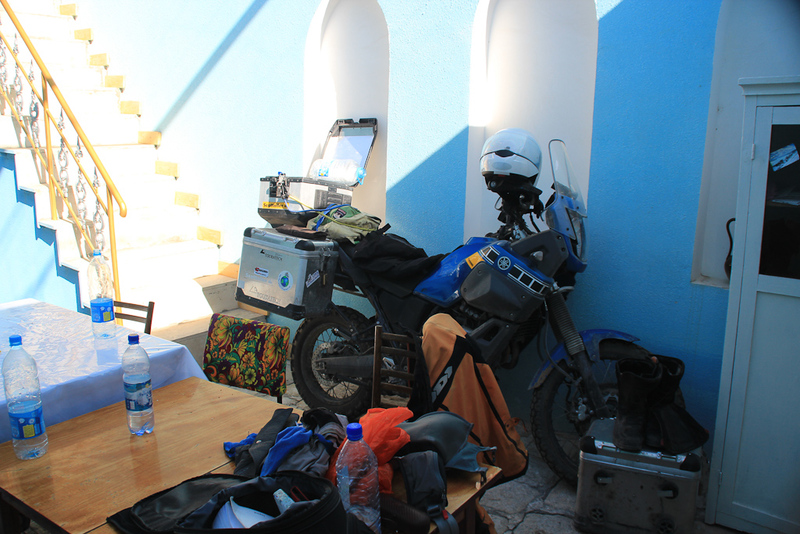 The courtyard was quite small and it was already crowded with an Africa Twin with a humungous fuel tank (43 liters the owner declared later) but I managed to fit the bike in a corner. Cédric, the French owner of the Africa Twin soon showed up and so did Tarik (FR) and Bruna (FR-BR), Tristan (FR) and Tina (SI). A very friendly bunch that was also checking in that same day. We lazed around in the scorching heat of the morning and around lunch Tristan, a regular patron of Bukhara and Madina’s took me and Cédric for shashlik lunch at the market and to visit Char Minar in the old town. It was so hot that we looked at Char Minar for a very long time. Not because of its beauty or its many interesting and complex features but because there was a bench in the shade in front of it conveniently situated at the entrance of a little shop selling drinks. Later in the day we visited an old mausoleum and went for dinner all together, the English bunch and the French bunch but we didn’t mingle, as if an invisible channel had been drawn on the table. Feeling that my tourist duties were not fulfilled, I set off the next day with the intention of doing some sightseeing but as usual, I set off after 10:30. It was already more than 35 degrees in the shade and a lot more in the sun and I found out that I couldn’t even take refuge in the Ark because it’s being restored so I took refuge in the mosque just in front of it, the official mosque of the emirs of old after going around the Ark to try to find another entrance and ignoring an old man who kept shouting Zindan at me and pointing in the general direction of the old prison museum. The mosque had air conditioning and I was alright there, until I tried to approach the Koran and was shooed away by one of the locals who interrupted his own prayer to show me that I couldn’t approach the stand where the Koran was. That was my cue to leave and keep playing tourist. Next stop was Job’s well and its small water museum where I hadn’t planned to spend much time. I hadn’t even planned to enter and when they asked me to pay for the ticket, I had to go back out and count my money. In the end, I decided to enter and it was a good thing. – I come from France. I came by motorcycle. I had just been called crazy by my museum guide, this was a sign that I had to make the conversation last. Fortunately, she was of the same opinion and after she took care of some other visitors, we went back to the front of the museum and spent the rest of the afternoon talking about my trip, her aspirations, sharing photos and just chatting. When the museum closed, she proposed to show me the other monument I had planned to see that day, the Samani mausoleum but only if I carried her computer. 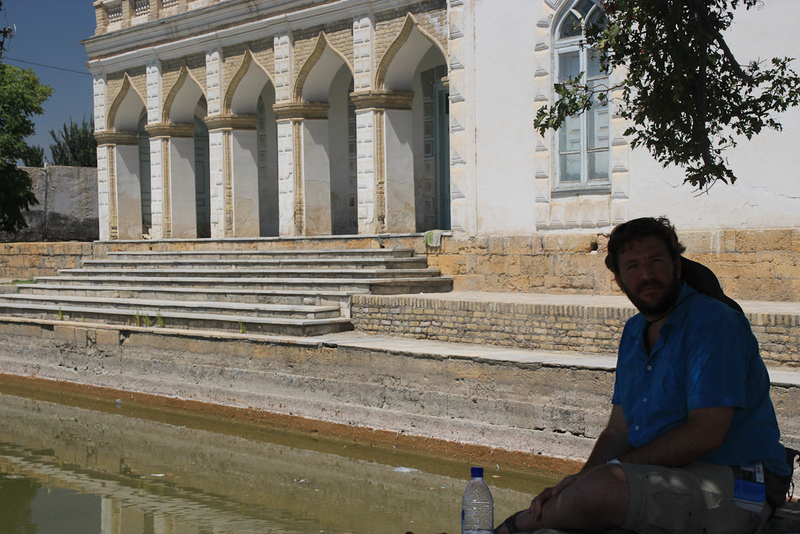 I am a gentleman so I said yes and not only she showed me the mausoleum but plenty of other interesting things I had missed in Bukhara while we slowly made our way to the central pond. The last place we entered was the carpet museum where her sister works. After the introductions: “Here’s the crazy guy travelling on a motorcycle”, I was admitted into the museum. While her sister explained the carpets in Russian and I struggled to understand, Nigina translated into English for me. She was truly determined to make a good tourist out of me. So much so that she proposed to pick me up at my hotel the next day and come with me to the Summer Palace. And so she did and we spent the whole day together, sharing stories and laughs but neither drinks nor food because it was the month of Ramadan and she was fasting. Out of respect I tried to refrain from drinking too ostentatiously in front of her but the heat was too much and I wasn’t going to dehydrate (I don’t know how she was resisting it). Aside from being a very bright woman, Nigina studied to be a guide and knows a lot about her city and her country; it was very instructive to spend the day in such good company. She told me stories about each place we visited and she had a small book telling the legends related to each place. Ah! My favorite kind of history is of course fake history: legends! What more could I ask? But the heat of the mid-afternoon was too much and she had to take a rest, otherwise she would faint before the maghreb hour and so she went to her sister’s museum while I went to the internet café. Internet is quite scarce in Bukhara and the only true option is the café, even in hotels the traffic is limited to emails or charged by the hour. When the heat of the afternoon died down a bit, I went for her and we spent some more time together. She had promised to tell me about the traditional Uzbek wedding ceremonies and I introduced her to the French bunch (I call it the French bunch but it includes Tina, who is not French, not in the least). On the way to the taxi she told me about Nasreddin, the guy sitting on a donkey next to the central pond in Bukhara. Uzbekistan’s comedic hero. Later, I went for dinner with Bruna, Katya (she had arrived later at the guesthouse), Tarik, Cédric and Marion (she just appeared out of nowhere and asked if she could sit with us). It was the end of a very pleasant stay in a very beautiful city where I met plenty of good people.